When it comes to fitness, most people are a little bit overwhelmed at the sheer confusion surrounding certain exercises and their benefits. Learning how to deadlift should be a priority for anyone with serious ambitions inside the gym, such is the great power it holds. However, it remains a very underestimated move which is often ignored or, even worse, people are advised not to perform it for fear of causing damage to their physique. This is ludicrous, of course, as it remains the king of gym based strength exercises. The issue lies with teaching people how to do it properly. * Keep your feet set underneath the bar. * Take a 20 degree bend in your knees. * Hinge your back forward slightly. * Your back should remain flat and tight during this portion of the move. * Maximize your strength by gripping with an alternate grip in either hand. * Push through the heels as you raise the load. * As you push up, force your hips forward to help you form a straight line with your body. * At the top of the move, your lower back should be slightly extended, chest out proud. If you follow all eight steps above you will learn the perfect technique for getting the most out of this very powerful exercise. Better still, you will do it with perfect form which always ensures better results. Let’s look at some aspects of the move in a bit more detail now. The first of which is the bend in your knees. Many people mistakenly sit into this exercise in the same way they would for a barbell squat. It’s not the same exercise, and doesn’t require the same bend in the knee. Experimenting with your grip can also return great gains, so get creative with the various hand positions as you gain familiarity with the techniques above. Keeping your back straight is the difficult part, but if you can focus on pushing your shoulders back at the peak of the repetition you will eliminate this issue altogether. When you begin to lift the weight, focus on pushing with all your force going through the heels. 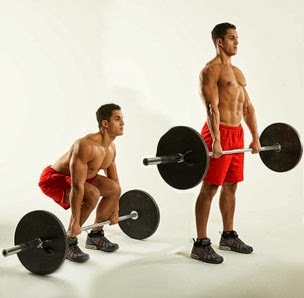 Many people mistakenly stand on the balls of their feet and end up falling forwards during the rep.
Now that you know how to deadlift with correct technique, you should take some time to practice these principles at home before you go to the gym. This removes confusion from the equation and ensures you can push yourself hard in your next training session. While it is true that learning how to lose weight or build muscle have become needlessly confusing affairs for most people, the age old principles like this still remain as important today as they were twenty five years ago. More details: You can see the exact technique demonstrating how to deadlift as well as easy but proven tips discussing how to lose weight straight from Russ Howe PTI, the most sought after personal trainer in the UK and on Youtube.